California Camp Fire: They survived the flames. But now they’re trapped. The Camp Fire closed in too fast for some survivors to leave. And many families who evacuated have nowhere to go. Last Wednesday morning, as a fellow reporter and I drove the three and a half hours from Oakland, California, to the tiny town of Pulga, our phones kept telling us to turn around. 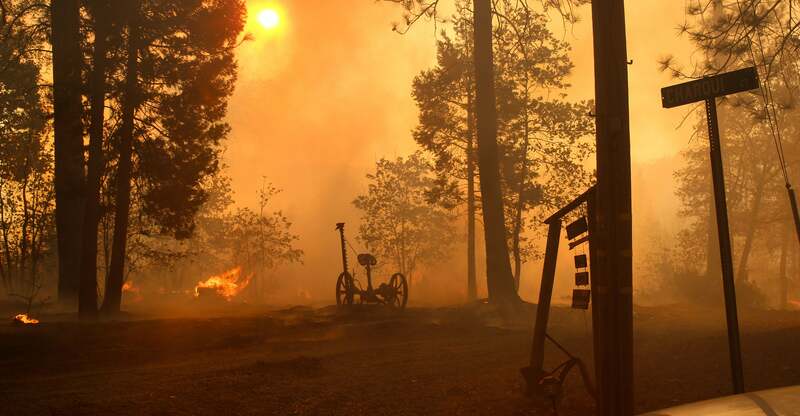 Thanks to the Camp Fire, a roughly 200-square-mile swath of Butte County and the surrounding area is now burnt or burning. Google Maps knew this, rerouting us around the evacuation zone every time we typed in our destination. Since the fire began on the morning of Thursday, Nov. 8, it has killed at least 77 people—a number that increases every day as investigators and rescue dogs find more remains. The list of missing persons initially grew until it passed 1,200, but is finally starting to shrink. As of Friday, only firefighters, electric company workers, railroaders, emergency personnel, and credentialed journalists were being allowed into the evacuated area. The officer at our first checkpoint said officials have caught people trying to use forged documentation to enter the evacuation zone to loot the few homes that didn’t burn down in the blaze. Once we entered the zone via Highway 70 around Oroville, the roads were empty save for the occasional emergency management truck and armored vehicles stationed at checkpoints. It had been six days since the fire started, and smoke was still piping from smoldering tree stumps and the rubble of burned houses. The air was impossibly thick, casting an emerald and amber matte across the partially erased pine forest. Some of the trees left standing were burnt only on one side, while others had been whittled by fire, like matchsticks balanced in ashtrays. A sparrow taking flight off a charred branch could be enough to push a dead pine to the ground—or into a telephone or power line. Ash was everywhere. More than 50,000 people had evacuated the area, leaving towns like Concow, Magalia, North Pines, Lovelock, Paradise, Humbug, Powellton, Centerville, Inskip, and Stirling essentially vacant. About 14,000 structures, largely homes, are gone forever, according to the California Department of Forestry and Fire Protection. So far, the only obvious trace of the Federal Emergency Management Agency is an office in an old Sears in Chico where people can apply for assistance, even though the evacuated area looks like a war zone. How the fire started is unclear. By 6:30 a.m. on Nov. 8, firefighters were dispatched to contain a vegetation fire, being fanned by 35 mph winds, that started “under the high-tension power lines” at Poe Dam on the Feather River, according to radio dispatches obtained by the Mercury News. Poe Dam is about a mile from Pulga, across the river from where we were headed. And PG&E, the investor-owned utility that powers most of Northern California, has since reported two equipment failures that occurred the morning the fire started, one right near the spot where the firefighters were dispatched on the Feather River. The other was in Concow—which the California Department of Forestry and Fire Protection cited last week as a potential second origin of the fire. Pulga is a ghost town, of sorts, located in a gully on a stunning part of the Feather River. I’ve gone there every couple of months or so for nearly four years, since my friend Betsy Ann Cowley bought the town from some people who had run a hypnotism school there since the mid-1990s. Throughout the first half of the 20th century, the area was home to hundreds of people who worked in the Vesuvianite mine and on the railroad and sent their kids to the town’s one-room schoolhouse. Most everyone left by the end of the ’60s, and today it’s just Betsy and a rotating cast of friends working to rebuild the property. Pulga is in the heart of the Camp Fire evacuation zone—and I went there last week to learn how people who had not gotten out were managing. Cowley is there now, and she can’t leave. The Union Pacific railroad tracks that run through the town of Pulga, California. No one who lives in the evacuation zone and has stayed through the fire can leave, now, except for in a few areas that have begun to reopen. If they did leave, they wouldn’t be let back in. The people I met who have stayed in their homes, however, did not do so by choice: They were trapped by fires that walled off roads within minutes of the first sign of smoke, leaving them to fight to save their properties or die in the flames. Those who did manage to leave are packed in the homes of friends and family, hotels, shelters, cars, or tent towns that sprouted nearly as quickly as the fire spread, destroying the towns and hamlets in its path. It’s unclear how long the ones who stayed will be trapped in the evacuation zone. It could be days, or weeks. And it’s a mystery, too, how long the ones who made it out—many of whom have formed an ad hoc community while living in donated tents, in parking lots, in the neighboring town of Chico—will remain displaced. The ones who stayed are surviving on whatever food and gas they happened to have before the firestorm. The ones who left but had nowhere to go are surviving on whatever savings they had plus donations of food, blankets, and cigarettes from strangers. No one who lives in the evacuation zone and has stayed through the fire can leave, now, except for in a few areas that have begun to reopen. If they did, they wouldn’t be let back in. “There was no warning,” said Virginia Wildblood, a neighbor of the Evanses’ who was unable to evacuate before the fire reached her and her husband’s home. As the fire raged, the Wildbloods, the Evanses, and a neighbor named Fred worked to terraform their land as fast as possible to blockade their homes from walls of fire. Using dozers and whatever farm implements they could find, neighbors started throwing dirt in piles to stop the encroaching flames. The homes of neighbors who had left were consumed by the blaze. No one knows how long the evacuation order will last. Wildblood and her husband have been trapped on their property for more than a week, knowing that if they’re caught away from their home they could be forced to evacuate indefinitely. “The only phone call we got was from PG&E the day before saying there is high fire danger. There’s going to be high winds, and we may turn off the power,” Wildblood said as we chatted in the Evanses’ kitchen. “That never happened. If they had done that, this fire wouldn’t have happened.” The Wildbloods are leaving Concow this week, in part for Thanksgiving and in part because they’ve run out of gas for their generators. They don’t know when they’ll be able to return. Outside the Rock House Restaurant on Highway 70 in Yankee Hill, California. Originally built in 1937, the restaurant is now completely razed from the fire. Some vehicles made it out in time the day the Camp Fire ignited. Others became grenades after being hit by flaming embers. The worst of it may have happened in a town called Paradise, approximate population 26,000. “I was driving down Neal Road, and the houses by the horse stables were already on fire—the side of the road was on fire as we were driving through,” said David Cuen, a Paradise resident whom I met at a tent encampment of Camp Fire survivors in a Walmart parking lot in Chico. Neal Road is one of only three roads from Paradise with access to Highway 99. It was one of the few ways out: “I look in my rearview mirror, count back 10 cars, and the 10th or 15th car, it blew up. The flames had overwhelmed all the cars by it. And the cops were making people get in cars that had room. So, you’re talking four to five people in each car.” Cuen spent the week after escaping the fire sharing a tent with his wife and her family. That Walmart parking lot was an evacuee camp. Most of the people there knew their homes were gone. Everyone felt lucky to be alive. Here was ground zero for people who lost everything, who had no relatives with extra room, no cars, no money—only what they were able to grab in the slim window of time before everyone realized the fire was coming and they needed a way out. Volunteers ferried around paper plates of hot food, baby clothes, jackets, and blankets. No one was wearing a mask; the air, which was nearly unbreathable, was far from the biggest concern. More pressing was the cold at night. “I stayed out in a tent one day over there because I was helping out,” one girl, around 13, told me as she approached Cuen and I midconversation with a tray of quesadillas. “It was freezing. I put handwarmers in my socks and in my shirt just for that one night.” Still, despite the chill, the uncertainty, the crying babies, the alphabet soup of emergency personnel—National Guard, Cal Fire, sheriffs’ offices, California Highway Patrol—everyone in the parking lot said that they were being taken care of. I couldn’t speak to anyone at a tent for more than five minutes without someone interrupting us with an offering of food, gift cards, or warm clothing donated mostly from people in and around Chico. Decency prevailed. “There was a problem with looting early on, but we pretty much try to keep the bad element out,” Cuen told me, hunkered on a folding chair with his hands tucked inside a sweatshirt. “We don’t like tweakers around, and we don’t mess with thieves or people who are trying to take advantage of the situation. But the security has been pretty good. That’s why we formed this connection, and we watch out for each other.” Police came, but security at the encampment was mostly vigilante: the dispossessed protecting each other. Cuen showed me his storage tent, which couldn’t be slept in because it was missing poles but was good enough to keep his family’s blankets shielded from the ash hanging in the air. “I’d rather be in a tent than a shelter because with the tents we know the people all around us. You know, in a shelter, you don’t know who you’re going to sleep next to day by day. I take my dog and make my rounds here, make sure no one is messing with no one’s stuff.” In addition to the tent cities, nearly a dozen shelters are housing about 1,400 evacuees outside the evacuation zone. One large shelter in Chico experienced an outbreak of norovirus and had to quarantine some of its temporary residents. Cuen had only lived in Paradise for two months before the fires came. He’d moved there with his wife this fall to help care for her aging mother. He told me he had a sense the fire was coming when the sky became red around 6:30 a.m. on Nov. 8. Within a couple of hours, the entire town of Paradise was struggling to make it out alive. Now, it’s a smoldering wasteland. He found a new community in that Walmart parking lot. They had grown to know each other’s stories, what towns they fled from, who was missing, whose houses might have survived, who had babies, dog food, and extra cigarettes. I walked in on conversations about plans to rebuild, about neighbors who had been trapped, stories of flights from towering flames that snapped pines, of red skies, of the haunting roar from the rapidly encroaching inferno. Fires are loud. Beyond the sounds of propane tanks and cars exploding, beyond the cracking of ancient trees and caving roofs, the whoosh of fires was amplified by the winds that spread the flames. And yet: People were smiling. Kids were laughing and pestering their parents to help them open toy cars strangers handed to them. Walmart must have been making a killing. But like the fires that took everything, the community formed in that Walmart parking lot didn’t take long to disappear. By Sunday afternoon, the area was ordered to start evacuating. The fire survivors, if they had any mobility, were being told to re-establish camp somewhere else, find another parking lot, or if they were willing, go to a shelter at a local fairgrounds about 30 minutes away. But like the fires that took everything, the community formed in that Walmart parking lot didn’t take long to disappear. Last Thursday, Jazmin Hamburg didn’t know what would happen next. She had lived in a small house in Magalia with eight other family members, including her two kids: Her younger son Aden was 10 months old, while Lucas was 4. She and her family were living in a battered motor home in a nearby parking lot. There was no communication. There was no alert, she told me, describing the day the fire broke out and her family fled: “There was nothing. If my sister didn’t contact me, I don’t even know what would have happened. We’re not sure if our house is burned.” She’d been checking Facebook constantly to get more information but said nothing she was reading on social media, about which properties were still standing and where to get help, was reliable. Inside and outside the evacuation zone, the people I met expressed a kind of nebulous rancor toward PG&E. The utility owns the electrical equipment and power lines that have been responsible for at least 17 of the 21 major fires that burned across Northern California last year. The company is already on the hook for what could amount to about $15 billion in damages from those fires, a figure that could double with the Camp Fire if PG&E is found responsible for the latest conflagration. It’s unclear who will absorb that expense. If it is PG&E’s fault, people who lost their homes but hope to rebuild will probably have to rely on the very company that cost them everything—unless they choose to use solar power or some alternative form of energy in order to pry themselves from the grid. We’re not supposed to worry about infrastructure. It’s just what’s under the hood of cities and towns. Even in places like Butte County, where you can drive on one-lane highways a half-hour or more without seeing a gas station or general store, a utility like PG&E is ubiquitous. Almost everyone there depends on PG&E, and everyone knows PG&E is culpable for some wildfires, but there’s no way to protest: It’s most people’s only option for power. It has no face; it shows itself in the form of monthly bills, branded trucks, and the occasional phone call or email about upcoming maintenance. Everyone who told me they were unhappy with PG&E paused. So many donations have been brought to the Walmart tent camp in Chico, California, that some go unclaimed. Were they really angry at the electric company? Yes. But what did that even mean? People want their homes back and money to rebuild. PG&E may end up funding some of the recovery as it fixes its wires and rebuilds its towers; when the lights are back on, they’ll also be the ones sending people the bill. And earlier this year, state lawmakers helped to shield PG&E from billions in wildfire liability: California Senate Bill 901, which Gov. Jerry Brown signed in September, allows electric utilities in the state to pass on such costs to ratepayers, though the law only applies to some fires from 2017 and doesn’t fully go into effect until 2019. In Pulga now, there is an investigation underway. Personnel from Cal Fire were driving up and down a stretch of Pulga Road, hoping to discern what started the flames. Private security guards have been stationed to keep media and others away, but we were staying there, so we had some access to the area. The investigation could take months. It’s hard to say what will fill this vacuum of certainty. PG&E emailed my friend Betsy Ann Cowley on Nov. 7, the day before the fire started, saying it was planning some maintenance nearby and would probably need to come by her town, as well. Both Virginia Wildblood and Jeff Evans told me they received a robocall the day before the fire began—a warning that power might be temporarily suspended. To Cowley and others, all of this feels ominous now, though no one knows what it really means. As she waits to find out, Cowley can’t leave her property until the evacuation order is lifted. The California Department of Forestry and Fire Protection’s office said there’s no telling when that will be. It’s hard to say what will fill this vacuum of certainty. People are rushing to local Facebook groups to share resources about where evacuees can wait in lines to get gift cards and have their cheeks swabbed to help identify the remains of missing relatives. Some neighbors with spare resources are planning to build new structures on their land for families in need. The community seems prepared to come together now, but it’s not clear how long that feeling will last. Not everyone has fire insurance. Applying for FEMA aid requires the kind of paperwork most survivors may no longer have handy, like their insurance information. The will to rebuild felt strong among everyone I spoke to—Butte County is their home. But community isn’t something that stands strong on its own. It requires a space for people to gather, to communicate, to realize that for better or worse they are in something together. As the days the evacuation zone remains active continue to add up, as investigators continue to look for and identify remains and determine the Camp Fire’s cause, the weight of shared uncertainty that appears to have united so many—to save pets and protect each other’s salvaged belongings in the tent cities now being disbanded—may force some to look out more for themselves. It’s supposed to rain on Wednesday. Water can extinguish fire. But after a firestorm, rain can also push burned trees down mountains so they might clog waterways, causing flooding and mudslides. The Camp Fire may soon be out, but there are still thousands of people with nowhere to go. The blaze took what it wanted, which appears to be almost everything. The now-hollowed-out towns and skeletal forests left in its wake aren’t a sure foundation on which to rebuild. They’re the groundwork of the next crisis.